I seldom crawl around in caves, or trek than 15 miles off the beaten track, even in pursuit of chukars. I don’t climb (real) mountains, nor sail the open seas. So technically, I’m not an adventurer, going where no man has gone before. But Flick is the consummate explorer. Given the chance, he would take that first voyage to Mars. At nine weeks, he is bold and inquisitive, nose and eyes getting up close and personal with virtually everything new in his world (which is to say, everything in the world). Unlike pilots, where there are few old and bold ones, in a pup boldness within reason is an attribute. Flick’s is textbook: most discoveries are met with curiosity and a move closer, a sniff and a touch. The bigger, louder, stranger stuff is scrutinized from a distance … a first, tentative foray closer is followed by a distancing and further study. Then, Katie bar the door as he is probably heading for it again, hell-bent for election. Which is why careful monitoring by a human is critical at this stage. 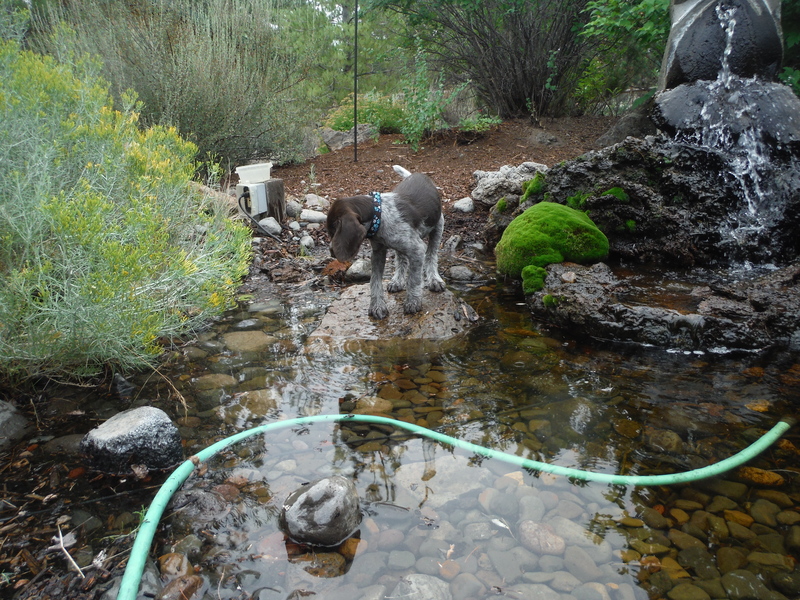 The things that can cut, crush, poison, scare and irritate a wirehair puppy are myriad. Only we humans (theoretically) know what they are – he doesn’t, and won’t for quite a while, if ever. But watching the little guy (and he is tiny) discover his world is a reminder of our own past, that time when everything was fresh and new. A squeak here, a bonk there … dazzling lights or a man with a beard, everything is exciting, intriguing and worth investigation. Flick’s top-ten list currently includes mouth-sized rocks for carrying, his packmates, other puppies, the owl toy that crinkles and squeaks, my hanging-bumper swing toy, anyplace he can’t go, anything he can’t have, anything that bleeds when bitten, and anything moving. But it is as they say, subject to change without notice. I look at Flick’s actions as a reminder that we, too, can still keep our eyes wide open for discoveries. Just don’t bite that electrical cord. Thank you for sharing. Keep posting Flicks further adventures. Those lil blades being sucked up in the vacuum! Keep the chronicles coming you make us laugh everyday! Glad to share the adventure, Sue. And adventure it is!